I would like to find a children's SF book I read in the 1980s. I don't recall the last length, but I know it had scattered illustrations. A group of kids go over to the house of an inventor, probably related to one of them. The inventor was depicted with a white goatee; I remember his beard being described as "triangular.". He had built a teleportation device. I think it looked like a giant lightbulb, sitting on a waist-high table, with a pair of levers in front of it. After some philosophical falderal about alternate realities, the device is activated. There's a crash, or flash, or something, but nobody seems to go anywhere. However, there are now two of each of them. The twin inventors decide that they must come from very similar planets. Both built machines, but only one worked, teleporting everyone to the site if the other world's (non-functional) device. There is argument about which device worked and whose planet they are on. The last thing I remember, but I know it wasn't the end, was everyone going outside and seeing the sky was green. Since Which Choose Your Own Adventure books had consistent back-stories/settings? was closed, I have been gradually going through the Choose Your Own Adventure Series, book by book, to see whether more of the books have consistent backstories associated with them. Remarkably, when I got to book number 21, Hyperspace, I found the answer to this question. There on the cover are the inventor with the triangular beard (named Professor Zinka, apparently) and the light bulb teleportation machine I described. 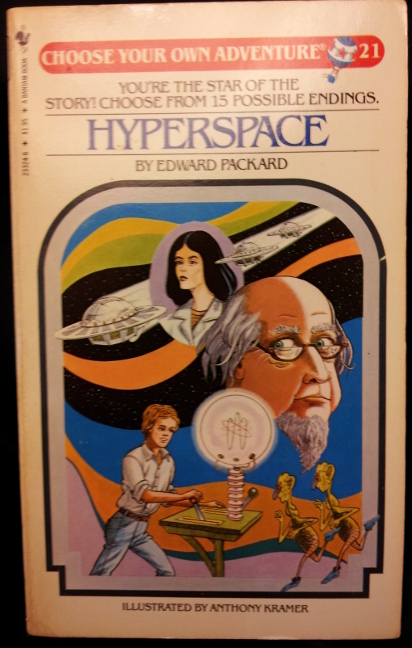 Hyperspace begins with Professor Karl Zinka moving into your neighborhood and passing out books on hyperspace to kids wandering by his house. With your friendship thus soundly established, the Professor calls you for help after he tries to enter hyperspace, but instead the hyperspace enters him (hopefully after some nice hyper-foreplay). If you alert the authorities, the universe is destroyed. The right course of action, obviously, is to run blindly into the strange old man's house and be prepared for wild, secret adventures. In the trippiest branch of the ensuing story, you learn that you are a character in a dream, and that if the bald, middle-aged coma patient dreaming about you wakes up, you'll cease to exist. Which Choose Your Own Adventure books had consistent back-stories/settings?